"I will do anything to protect my kids." Holy smokes, this looks awesome! Universal has debuted the first official trailer for a home invasion thriller titled Breaking In, which kind of twists the old home invasion concept just a bit. Gabrielle Union stars as a woman who moves with her children to her father's old home which features very high tech security. When intruders break in and lock her out, she must figure out how to break back in and rescue her kids, stopping at nothing to get back at these invaders. This is, crazy enough, the next movie from V for Vendetta director James McTeigue. The film's full cast includes Billy Burke, Richard Cabral, Seth Carr, Levi Meaden, and Ajiona Alexus. This seriously looks badass, and I am glad it has some twists on the unusual home invasion plot. I'm definitely in. This May, payback is a mother. 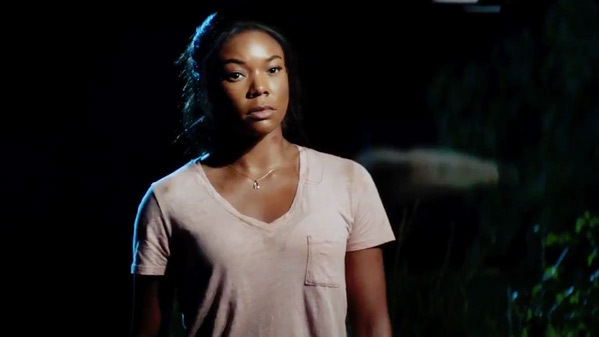 Next Mother’s Day, Gabrielle Union stars as a woman who will stop at nothing to rescue her two children being held hostage in a house designed with impenetrable security. No trap, no trick and especially no man inside can match a mother with a mission when she is determined on Breaking In. Breaking In is directed by British filmmaker James McTeigue, of the films V for Vendetta, Ninja Assassin, The Raven, and Survivor previously. The screenplay is written by Ryan Engle (Non-Stop, Rampage); based on a story by Jaime Primak Sullivan. This film is produced by Will Packer and Gabrielle Union, as well as Will Packer Productions' James Lopez, and Practical Pictures' Craig Perry and Sheila Taylor. Universal will open James McTeigue's Breaking In in theaters everywhere starting May 11th this summer. First impression? You in?